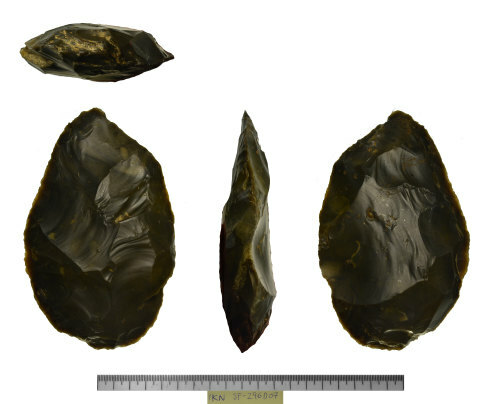 A complete flint lower to middle paleolithic cordate handaxe. It is leaf-shaped and roughly planoconvex in cross-section. Both faces are covered with shallow, invasive flaking and there are further patches of sub-parallel, long, low angle retouch along the edges on both faces. The flint is dark brown in colour with a glossy patina and there are patches of a hard silty deposit on one face. It survives in remarkably fine condition with fairly sharp edges and minimal damage.